Need help reading labels for wheat allergies? Click here. Either blood tests or skin prick tests can confirm a wheat allergy in your child. If your child is truly allergic to wheat, and not intolerant to wheat (more on this below), the allergy skin test will develop a red rash or hive at the scratch site. Remember that wheat and wheat products are used in many products: breads, flours, cereals, stuffing, canned creamed vegetables, beers, ice cream and some vitamins. It might be necessary to keep a food diary to determine exactly what is causing your child’s allergies so that your allergist can test for the correct allergen. If you believe your child is intolerant to wheat, in other words, has severe gastrointestinal distress shortly after eating any kind of wheat or wheat product, then the allergy skin testing may come back negative. This doesn’t mean, however, that your child should begin eating wheat. Instead, it might mean he/she has gluten intolerance or celiac disease. 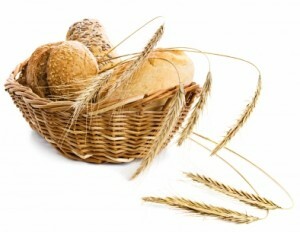 The allergy to wheat and the gluten intolerance both require that all wheat products be removed from your child’s diet. A wheat intolerance, called celiac disease, involves the villi in the intestine not being able to process wheat of any kind. Some people will have gastrointestinal issues, while others will have different symptoms such as failure to thrive in infants or nutrient deficiencies. Again, an allergy testing to wheat will not show positive. Recent research has determined that as many as 1 in 133 Americans have celiac disease, and many don’t know it. If someone in your family – a blood relative – has been diagnosed with celiac disease, most doctors will suggest that the rest of the family also be tested. You may not have symptoms – yet – although still have the disease. Some gastrointestinal doctors feel that a biopsy of the small intestine is called for to positively diagnose celiac disease. Others have determined that a blood test used to detect the anti-gliadin antibodies, called an ELISA, is appropriate to diagnose celiac along with a gluten-free diet. ELISA is an acronym that stands for Enzyme Linked Immuno-Sorbent Assay. ‘ELISA’ is not a test in itself; it is a method of testing. IgA is the principal immunoglobulin in secretions from respiratory and intestinal mucosal lining. IgA gliadin antibodies increase quickly in response to gluten in the diet and decrease quickly when gluten is absent from the diet. The IgA anti-gliadin antibodies can totally disappear in 2-6 months on a gluten free diet. IgG is the principal immunoglobulin in blood. It is important in providing immunity in a developing fetus because it will pass across the placental barrier. IgG anti-gliadin antibodies need a long time, sometimes more than a year, to become negative. The reverse is also true. A patient with celiac disease, who has been on a gluten free diet and tests negative for IgA anti-gliadin antibodies, will show a rapid increase in antibody production when challenged by gluten in the diet. The mother of a wheat intolerant child suggested that you buy a bread machine. Use many different kinds of flour to make your bread for best results: almond flour, white rice flour, brown rice flour, arrowroot, tapioca or soy flour bearing in mind other food allergies. Add some xanthan gum as a binding agent. We have found that a combination of white rice flour (4 cups), potato starch (1 1/3 cups) and Tapioca flour (2/3 cup) make a nice substitute for flour in any recipe. We combined these flours together and kept them in the freezer. When we have a recipe that calls for flour, we use this combination with wonderful results. We also add 1 teaspoon of xanthan gum to any recipe as a binding agent. Then combine Amaranth with the other flours to make up the difference. Amaranth usually cannot be used on its own. It needs to be mixed with potato flour, tapioca or arrowroot flour. Guar gum is another binding agent that can be used in place of xanthan gum for corn sensitive individuals. Xanthan is derived from corn! Use half as much guar gum to replace xanthan gum. A warning: guar gum contains fiber and can irritate very sensitive intestines! There are also online stores that have wonderful gluten free products. Dairy Free Market is one such store, and Outside the Bread Box is another. This store is located in our city (Colorado Springs) and makes wonderful breads, cookies, crackers and even bagels! They ship anywhere, and I highly recommend their products.